As Kashmir’s unionists are locking horns over three Lok Sabha seats in the valley, it’s the grand old party National Conference leading the poll blitz with its vintage autonomy vows. However, it’s the sweeping wave coming from north Kashmir’s political windmills that makes NC decry ‘Delhi designs casting shadow on its magic number’. Having cautioned of senior Abdullah’s mercurial side, my highly strung fingers barely noted down the ten digits of arguably Kashmir’s seasoned unionist at present. It actually took me hours before I would decide upon the right time to disturb him for an interview, that too, to a cub reporter not many know of. It was exactly around 5:00 in the evening when I, with my fingers now crossed, dialed the much-ambitious phone-call to Dr. Farooq Abdullah – who noticeably has quite a non-political WhatsApp picture posing candidly with in-style sunglasses and sporting an oddly orange-shaded golf attire, supposedly clicked while trying his hands on the rich-man’s game. “Hello yes,” came a croaky voice from the other side of the line. And with that, my mixed bit of excitement and nervousness played the better of me: he mistook me to be a reporter from the Frontline magazine. But then, to my fortunes, the happy Farooq Abdullah asked me to ring him sharp at 10:00 the next morning. I did so, only to be uninterestedly given another timeslot – 5:00 pm. 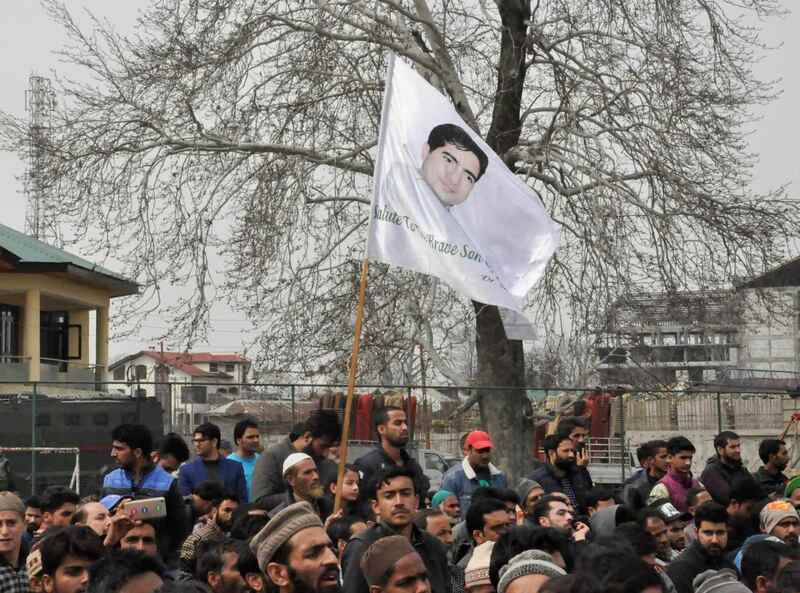 Himself his party’s parliamentary contestant from central Kashmir, Abdullah had a field-day ahead in Ganderbal where he was scheduled to hold a political convention with his on-ground workers. It did not go as expected. He was reportedly booed by the students of Government Degree College while passing through the area. Moreover, later in the day, a video surfaced on social media, capturing a fumed Farooq Abdullah ridiculing an unlikely question posed by a local journalist; thus now indicating the clear swings of his mood. Regardless, now for the third time in exactly 24 hours, I was about to test my luck – this time, only to fall flat and answerless. “Arrey bhai kya press, I’m busy with elections,” he ridiculed, and this time, with no intentions of another delay. More than being amazed by what I had just heard, it left me laughing. But true to what he said, not many political analysts and even the street-scholars pull down the possibilities of senior Abdullah easily securing his seat from Srinagar. And then the mini-sized red-flags of the party roped wide across the city streets, go on to speak of what is believed to be, a one-sided contest. Healing from the horrors of previous elections where Farooq Abdullah had faced his first electoral defeat in his 42 years of political career, he and his party now look forward to turning the tables. Going by what the chief spokesperson, Aga Ruhullah has to say – the party not only aims at retaining the 15 assembly seats won in 2014, but also are hopeful of crossing the majority magic-figures. 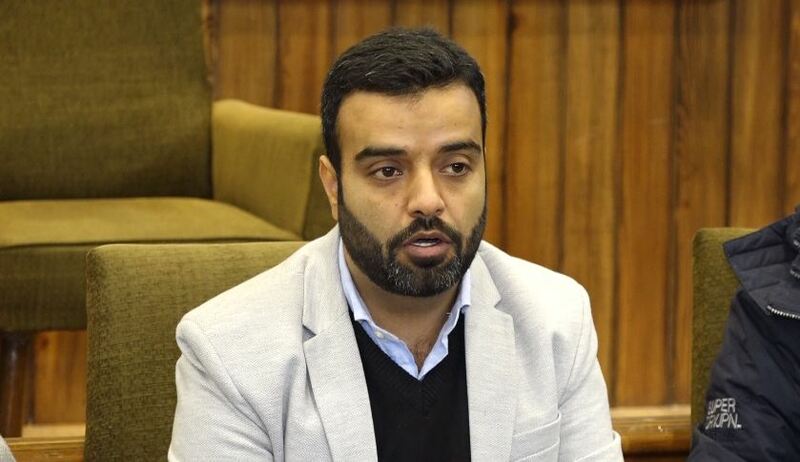 A soft-spoken individual, Ruhullah was last year nominated as party’s youngest-ever chief spokesman. Hailing from a family of an influential Shia cleric in Budgam, he lost his father in an IED blast in the year 2000. And only two years later, he contested his first assembly election where since he remains undefeated, marking a hat-trick of wins, with subsequent victories in 2008 and 2014. Having witnessed NC’s downfall up-and-close after being inducted by Omar Abdullah in his state cabinet in 2009, Ruhullah does accept that his party ‘may have made the mistake’ by driving itself from the ‘right’, but then, this time around, the party looks strategically sound while in-particular approaching all the three divisions of Jammu, Kashmir and Ladakh. Specifically talking about the Kashmir Valley, Ruhullah looks confident about winning the three parliamentary seats as he only counts Mehbooba Mufti’s PDP as the lone ‘direct-threat’ from southern Kashmir – where the party has unexpectedly handpicked a not-so-known face: Justice (Retd.) Hasnain Masoodi. 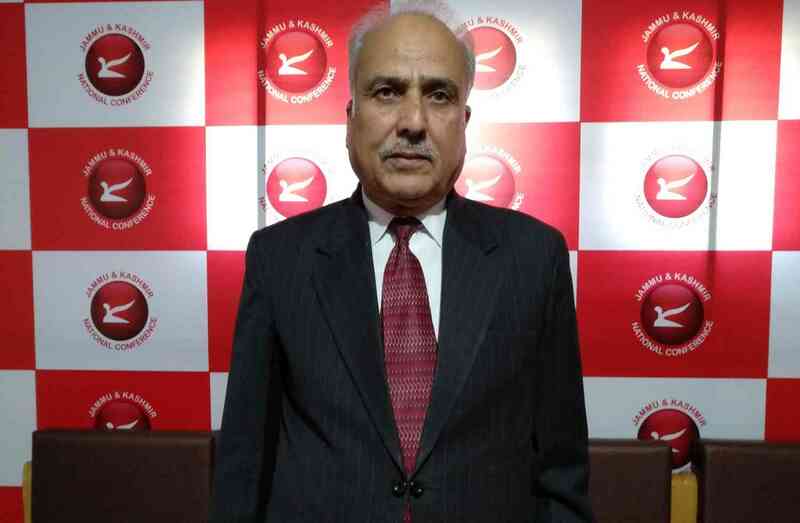 Masoodi, back home in Srinagar, was seen altering every minute mistake made by his associate while articulating the daily press statement, because now, gone are the days when the words of the former High Court judge would be reported by the media houses in Kashmir, without saying. Doubling his role as a columnist—who in the past figured number one on the list of secessionist writers prepared by state police’s intelligence wing in the valley— Masoodi has written scores of pieces on Kashmir’s right to autonomy, which ironically is also NC’s prime slogan going to the big elections. And perhaps, one can arguably say it has been Masoodi’s love for state subject that got him the parliamentary ticket from the south, from where someone as renowned a face as Mehbooba Mufti has her base strong and set, but then, that doesn’t seem to be a problem for the former justice. He believes Mehbooba’s ‘days are over’ after a ‘failed’ coalition with the right-wing BJP. Only recently after filing the nomination papers, he had taken a jibe at the former chief minister by saying that he now looks forward to talking about ‘milk, toffees and pellet raaj’. Masoodi might be a good writer, but as a novice politician, he was vocally seen short of new narratives during the 45-minute-long interview with this reporter. With each question, Masoodi was seen getting uncomfortable as he couldn’t help but conclude the majority of his answers with the ‘promise of autonomy’. For instance, while answering on how he has been trying to reach out to the people from his south Kashmir constituency, he swirled his reply around the autonomy subject like: “See, I haven’t held any huge public rally as yet, but then I am reaching out to my people in small groups of say 20-odd. “…If suppose you win, how exactly do you plan to retain the autonomy rights? There must be some concrete plan the party must have discussed with you?” I asked, about half an hour into the interview. Few days back, speaking to reporters in his backyard, Lone was seen coming hard on his rival-parties accusing them of making ‘false political promises’ to the people of Kashmir, ‘now-and-again’. “What they’re doing is nothing but building castles in air… Befooling the awaam has now become a trend, that’s all I would want to say. Thank you,” he answered, keeping it short and crisp. Akbar Lone, a veteran party loyalist is known for calling a spade a spade – something that has helped him seize some very controversial moments, be it in the assembly house, or on the streets of Kashmir. He’s one of the rare politicians who’s known for openly expressing his love for Pakistan, time and again. And for that, he has even been accused by the political pundits of ‘fuelling violence’ in the valley. Only recently his counterpart from Rafiabad, BJP’s MM War had demanded an FIR against Lone for ‘praising’ Pakistan. But then, Lone is Lone, who back home cared enough to express zero hoots in-return. Although the party has publicly displayed a ‘friendly contest’ with Congress in the southern part of Kashmir, the intentions are clear and straight – “It’s only a tactical alliance, not a possibility of a coalition,” as chief spokesman Ruhullah explains. Why, because of the ‘direct threat’: the BJP. According to Ruhullah, the party has been approaching the big elections keeping in mind the overall ‘dynamics’ of India’s political scenario, which he says, has ‘worsened’ since the right-wing BJP took over New Delhi. But Ruhullah does hope the party’s former alliance out-powers BJP in New Delhi “for India’s sake”, but if “God forbid”, he adds, “that doesn’t be the case… let there be any government, we’ll still fight forward to get away with draconian laws like Public Safety Act and the Armed Force Special Power Act” – the party’s other two highly-adapted slogans, apart from the autonomy assurance. And to execute these promises, he believes, the National Conference will have to do the unthinkable, of becoming the single-majority party in the state. “The people of J&K have witnessed a disaster in the form of coalition governments since 2002,” he says, revisiting the last time NC was in power all by itself. Donning a typically white kurta-pajama and a navy-blue Nehru coat, he took the centre stage amidst a loud ‘National Conference… Zindabad!’ slogans, coming from a highly enthusiastic crowd gathered in thousands. “It is no secret why I am here today, standing amongst my very own people,” the junior Abdullah started his speech, addressing a public rally in Baramulla’s Pattan area about a week back. “Hardly anyone would have noticed what I said in Bandipora the other day, but then credits to the Prime Minister sahab, who happened to not like my speech and used it as a target to attack his opposition, asking if they were in favour of what I said. Janaab Modi sahab, what did I even say? I would suggest you to go and read the history of this country, and see, under what circumstances did Jammu and Kashmir become the part of India,” Omar rolled his guns, amidst arouse of applause. Since his famous ‘I am a Muslim and an Indian too’ speech a decade back, the junior Abdullah has certainly come a long way to now remind New Delhi about his ‘autonomy rights’. In fact, majority of his public speeches going to the 2019 elections have swirled around the slogans of the state subject. “Our people have sacrificed their blood to colour the party flag in red,” he further reminded the crowd. “…the people of J&K have faced nothing but alienation. The so-called democracy here operates in accordance with the boycott calls; lesser the voter turnout, better for them… You people are deliberately threatened to not come out of your house and vote, and they reap benefits from it,” he added. If only then, Omar would’ve predicted the coming: the voter turnout for the Baramulla constituency only dipped further to 35%, compared to that of 39% in 2014. But in the times when Omar’s ‘direct threat’ BJP is making its steady climb in the valley chancing upon the low voter turnout – examining that, NC looks like one worried outfit. 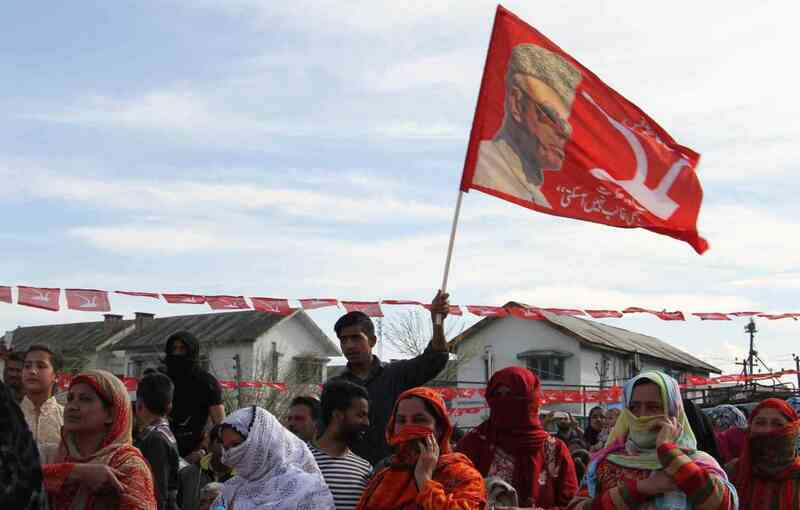 “The so-called nationalist or hyper-nationalist voters in Jammu, they are consolidated and since 2014 the fragmentation is being concentrated in the areas where anti-BJP or anti-establishment sentiments exist,” spokesperson Ruhullah says. The rise of the saffron party, alongside its ‘B-team’ – who Ruhullah refrains from calling ‘proxies, because understatement’ – has certainly left many in the NC camp brainstorming the defeat-plan. “They are a B-team who obviously cannot come with a nameplate of BJP in the valley; so to fight them, we are definitely in fray,” the spokesman says. Back in his newly-renovated house in Handwara, Sajad Lone was engaged in a heated conversation with his district SP over ‘unwanted slapping of PSAs’. “Listen, lower your voice… Mr SP, lower you voice… I said, lower the tone… Let you know, you are talking to someone who represents these people,” he warned the officer on the other side of the line. Seated in one corner of his living room, he was surrounded by at least about 100 men – adjusting themselves on the stairway, some standing at the doorstep, as many even sitting on the ground in an oddly congested setting – but, not a single bit of voice clashed to that of Lone’s, who looked absolutely irked by the officer’s response. If only he knew the first individual to face the anti-voting bullet on day 1 of parliamentary contest, would be a class 7 student from his very-own district. Once a separatist himself, Sajad Lone’s PC has over the years clearly evolved it’s ideology from representing resistance sentiments in the valley, to infamously aligning themselves to ‘elder brother’ Narendra Modi’s right-wing BJP. When Ruhullah spoke about fighting BJP’s proxy in the North, the first name that he had mentioned was of the PC chief. Lone is one hated personality in the NC camp, so much so, that even party’s new-joinee and the MLA face from Pattan area, Reyaz Bedar, ridicules him of being someone who has ‘no respect for people’s sentiments and ideology’. “What sort of character is he, I tell you; yesterday you were a militant and now you become a politician? Shameful,” he exclaimed to this reporter at his residence in Pattan. Contrastingly, Bedar was a counter-insurgent before having officially joined NC in August last year, with an aim to ‘reconstruct the Kashmiri society’. Not that the PC camp carry any lesser hate for the Abdullahs in-return. “Omar married a Sikh girl Payal Nath, his sister is married to Sachin Pilot and his father Farooq has a British wife… How is that not shameful?” Ashiq Hussain, party in-charge from Handwara constituency, had earlier told this reporter when he accompanied him on an on-field visit. Lone, who had recently come this close to joining hands with the saffron-party for the CM seat last year, now looks forward to executing his dream with sky-touching hopes going to the 2019 elections. And, it wouldn’t be baseless to say that the former separatist has an identical roadmap to what the BJP camp had earlier shared to this reporter – alarming a possibility of BJP-PC coalition with the right-wing party, if obviously, things go as per plan. But, if only it were to be that easy for Sajad Lone – keeping in mind the kind of possible competition it has from his strange bedfellows from the same north-end: Engineer Rashid and former IAS Shah Faesal. Likewise, even the National Conference sees the two controversial politicians as ‘trouble’ to secure crucial seats from the north. The IAS topper Faesal, who after resigning from his administrative service, later coming up with a party of his own, was initially rumoured to join the Abdullahs. True or not, Shah Faesal’s rise as a politician in Kashmir has been strangely set on unpredictable lines. Having now formed a political party of his own, JK Peoples Movement, he decided not to contest in any of the elections, parliamentary and as well the assembly; thus, raising claims of ‘another New Delhi’s plot’. Other than Faesal, Ruhullah also believes ‘people like Engineer Rashid’ are playing in accordance with ‘New Delhi designs’. Moreover, even People’s Conference’s Ashiq Hussain had termed Rashid an ‘agency guy who was close to getting exposed, but luck favoured him’. “He is Sajad sahab’s product, don’t you know?” Hussain remarked. Hailed by many for his dramatic street protests and ridiculed by several for being a ‘sell-out’, Rashid is one man full of conjectures. Commonly known as MLA Langate, he has gained some controversial moments in his tenure. Founder and a ‘patron’ of his very-own JK Awami Ittehad Party, he joined politics in 2008 contesting from his home-village, where he pulled off an upset victory by defeating veteran faces from NC and the PDP outfit. Back home in Srinagar, Rashid wearing his signature pheran was losing his breath while coughing due to a chilly March morning that had put him to a complete bed-rest. “This is just rubbish; I don’t even want to answer this question. It’s just shameful and disgraceful,” he said, struggling to overcome his wheezing voice. During the mid of the interview, Rashid suddenly termed PC’s mindset as ‘jaagirdaarana”, roughly implying colonial’. He was one angry not-so-young man! In his decade-long political presence in Kashmir valley, ‘no-nonsense’ Rashid hasn’t made many friends – but going by the recently captured candid movement shared between the Engineer and the new political entrant from Lolab, suggests a possible grouping of the two buddies – who share similar homes, accusations, claims and somewhat similar set of ideas. Regardless the bluff, when it comes to drawing a pattern between the two, the list of ‘potential- assembly-contestants’ does speak volumes, with many among them being PhDs, journalists, social activists, professors and scholars – similar to what Kejriwal’s party believably comprises of. “See, I am not ambitious man,” he continues, “I am not worried to get my MLAs in power. All I want to do is represent the sentiments of the people of Kashmir. I want to make a movement, not a party. “That’s why you see people are afraid of me. NC, PDP and PC, all know if Engineer Rashid shows a bit of inclination towards New Delhi, ‘hum sabki chutti hojaayegi [we all will have to pack our bags…],” and then with that counter-claim, Rashid concludes. Regardless of Rashid’s ‘lesser-ambitious’ plans of expanding his party, any small attempt leading to the ‘division of votes’ is a headache for over-the-horse NC camp. Like how Ruhullah sees, the ‘proxies, or the B Team’ working in accordance to the ‘Delhi design’, are like obstructers to the party to cross the ‘magic-40 plus’ figure. ‘The New Delhi establishment doesn’t want to entirely do away with NC, similarly they do not want PDP to die either; but they want to design the politics of Kashmir in a way that no single party goes beyond 15 seats,” Ruhullah notes. “They want us to secure about 8-10 seats in central, likewise 8-10 with PDP in south Kashmir and they want a political force in north [which is Shah Faesal, Engineer Rashid and Sajad Lone]; with the result of which no political party can gain beyond 15 seats in Kashmir valley, which is a clear damage to democracy,” he adds.